Designed to offer outstanding control performance and provide a comprehensive solution for a wide variety of applications; such as food processing, plastic manufacturing, and process applications requiring heat/cool control and process protection alarms in a compact DIN rail mounted package. Universal thermocouple or RTD input coupled with a responsive SMART auto-tuning PID control algorithm that is equipped with special functions, including soft start and nonlinear cooling. A complete set of process protection alarm functions; high and low limit, band and deviation are included. 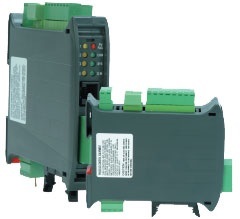 Modular interconnection allows simultaneous connection of all common instrument elements: power supply, serial interface, logic input and open collector output for common alarms. The RFS-AL alarm-logic input expansion unit makes use of the modular interconnection function to provide additional I/O capacity. 1. Easy configuration of the instrument, with descriptions of the parameters and the relative limits. 2. Computer storage of the complete configuration allowing it to be copied to other RFS units. 3. Copying and cloning of the configuration to a new instrument. 4. The configuration interface port can be used for configuration and for monitoring the process during setup. Automatically adjusts the PID parameters according to the process dynamics. An important characteristic of the Eurotherm Controls continuous self tuning algorithm is its ability to optimize control parameters without injecting any artificial disturbances into the system. To maximize the data transfer rates between the RFS and the host supervisory system, important operating parameters are grouped. Digital status information is transferred as data words to increase efficiency. The RFS is able to communicate relevant parameter information with a single data request, instead of a series of separate address operations. Process (high or low limit), Band and Deviation alarm outputs are available with the additional flexibility of latching and masking functions until the process variable reaches the alarm threshold. Band and Deviation alarms are also masked after a setpoint change until the process variable reaches the alarm threshold. The alarm latching function holds the alarm on until it is acknowledged. To reduce the maximum electrical loading at machine startup, the sequence of the RFS control outputs is scheduled according to the selected instrument Modbus address. This significantly reduces maximum startup current requirements and offers potential savings in electrical installation capacity and cabling specification requirements. All RFS I/O can be read directly over the Modbus communication interface by the host supervisory system. Additionally, the communication host can write to RFS outputs that are not assigned as alarm or status functions. This expands available PLC and host supervisory system I/O, simplifies machine troubleshooting and provides the ability to perform remote diagnostics. During the ON period of the output, the instrument measures the current through the load and generates an alarm condition if the current is lower than a pre-programmed threshold. A low current indicates a partial or total breakdown of the load or actuator SSR. During the OFF period of the output, the instrument measures the leakage current through the load and generates an alarm condition if the current is higher than a pre-programmed threshold value. A high leakage current indicates a short circuit of the actuator.